Duncan Keith won the Conn Smythe Trophy, scored the game-winning goal and led the Chicago Blackhawks past the Tampa Bay Lightning to win the Stanley Cup. 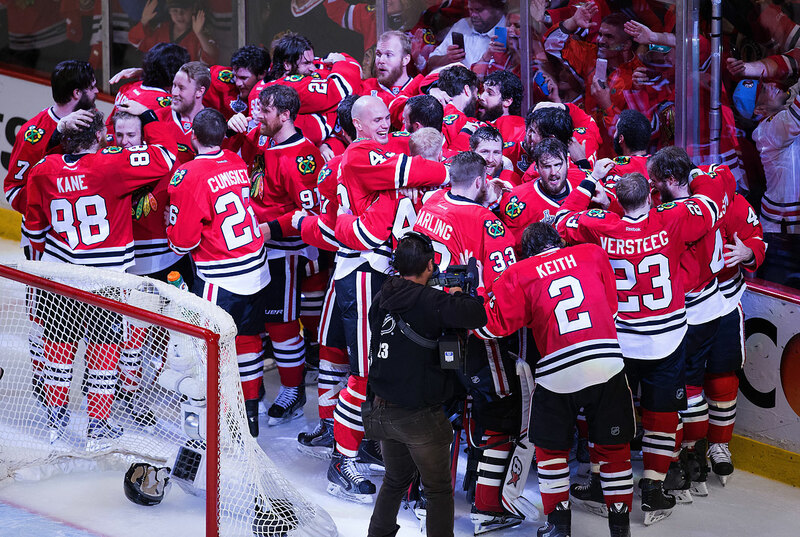 CHICAGO — Some 700 minutes were logged by Chicago Blackhawks defenseman Duncan Keith during this postseason, and this was the interminable part on Monday night: Staring at the bodies that were flowing through a tunnel and onto the United Center ice for the big celebration and waiting for his little boy to emerge from the crowd. Keith bounced nervously on his skates, shifting his weight back and forth. He pulled out a cell phone and presumably dialed up his wife, getting no answer. 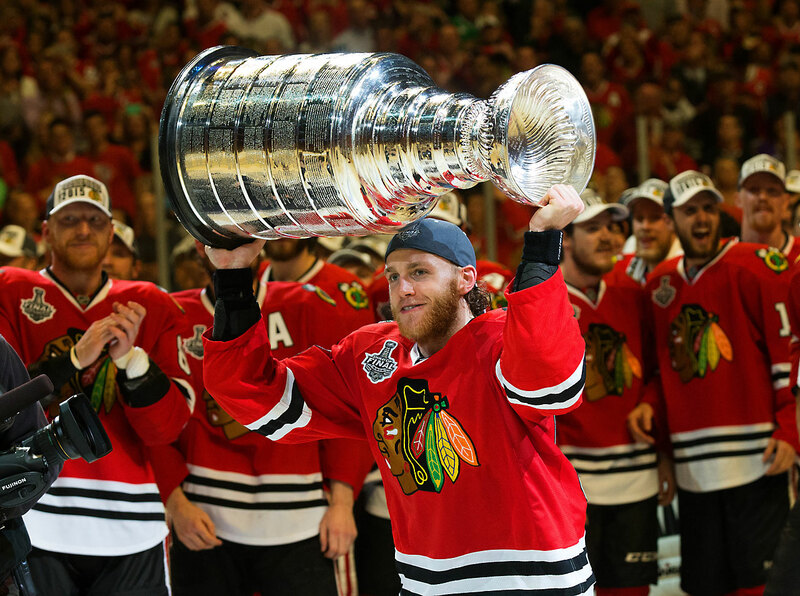 It was a moment that opposing teams had been waiting for, one that never arrived until the Stanley Cup fell into Chicago’s hands again. 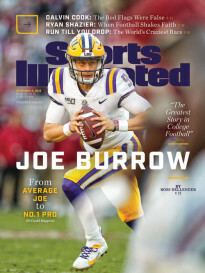 The best player of them all this spring and early summer, the post-human anomaly who fueled everything, was finally on edge. And of course even that, like every other tinge of uncertainty that Keith felt from mid-April until now, was fleeting. At last, out came little Colton Keith. Out stretched the boy’s arms and his papa took hold of what belonged to him, which would make it three prized possessions for Duncan Keith this time around. The Conn Smythe Trophy and that third Stanley Cup rounded out the collection, hard-earned by a 2–0 victory over the Tampa Bay Lightning that belonged to the two-time Norris Trophy winner as much as anyone. Keith’s second-period goal was the first of the night and therefore the game-winner. He skated 39 shifts and 30:19 total, both game highs. He blocked four shots for good measure. He was the unanimous choice for playoff MVP. And why not, because this night was like all the others, when Duncan Keith basically did more than anyone else. 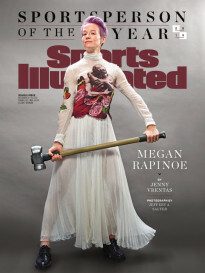 The superlatives will draw the attention, naturally. Keith’s 715:37 of playoff ice time comprised the fourth-heaviest workload since the stat became official in 1998. His 21 postseason points tied for the most by any defenseman over the last 20 years, matching Chris Pronger’s total for the Oilers in 2006. All three of his playoff goals were game-winners, and Monday’s was impressive for sure: Keith corralled a pass from Patrick Kane in the high slot, fired a shot at Ben Bishop, then outraced two nearby defenders to the rebound and the breakthrough score. And yet it should be noted that the Blackhawks can make their argument as a modern-day dynasty because Keith did, rather exquisitely, the job he is foremost tasked to do: Keep the other team’s offense down. Tampa Bay finished the regular season as the highest-scoring team in the league at 3.16 goals per game. The Lightning scored twice total in the final three games of the Stanley Cup Final and star forward Steven Stamkos was blanked across all six tilts. 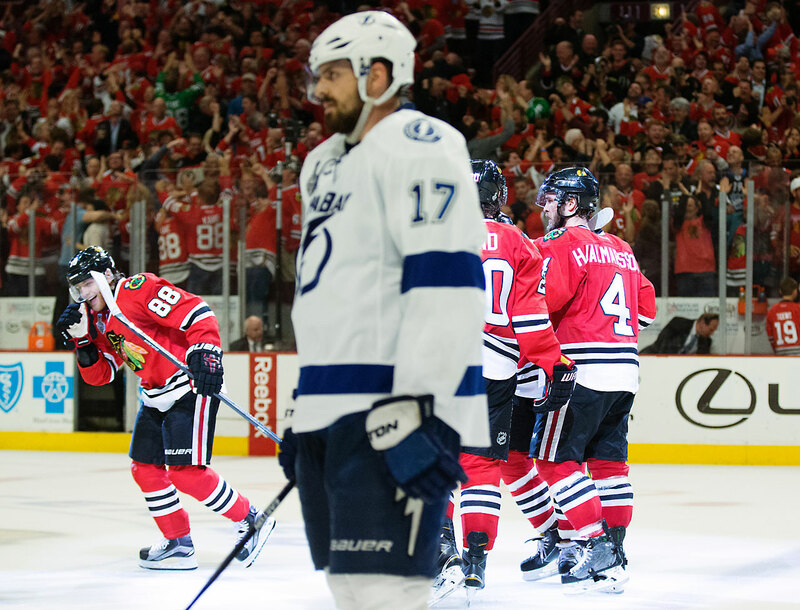 The speed and explosion that Tampa Bay promised certainly appeared in spurts and threatened to consume Chicago early on, but it ultimately fizzled. And it fizzled because the Blackhawks’ defense corps—at least the four of the backliners who participated in a significant way, anyway—never did fall off pace. The credit Keith deserves for that should be measured in proportion to how much time he spent snuffing out Tampa Bay’s attack. Which was a lot of time. Indeed, the 10th defenseman in history to be named playoff MVP stayed fully in character throughout this Stanley Cup run, and well after it. Keith damn near hot-potatoed the Conn Smythe Trophy itself once it was given to him, handing it off a couple nanoseconds after the obligatory photo op. A smile cracked his face as he took his lap with the Cup, but after that it was back to deflections. “I don’t get these awards without being on great teams with great players,” Keith said of the Smythe. “It was a total team effort, starting from the goalie out,” he said of the Blackhawks’ defensive effort against the Lightning. If Keith let up a bit, if he conceded anything at all, it was perhaps his need for a day off. The Chicago Blackhawks celebrate after defeating the Tampa Bay Lightning 2-0 in Game 6 to win their third Stanley Cup in the past six years. 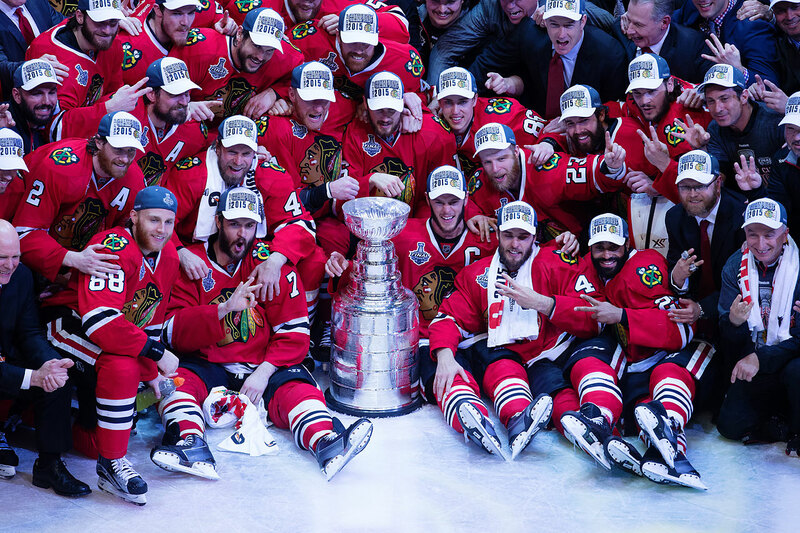 Chicago is the first team since the Detroit Red Wings to win three titles in a six-year stretch. Detroit did so in 1997, 1998 and 2002. 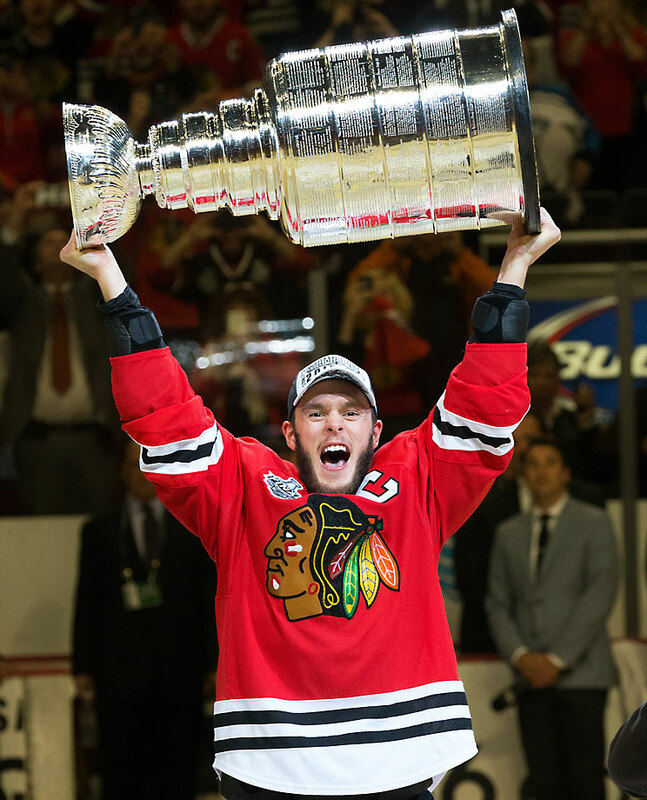 Jonathan Toews holds the Cup aloft after the Blackhawks clinched the Cup on home ice for the first time since 1938. 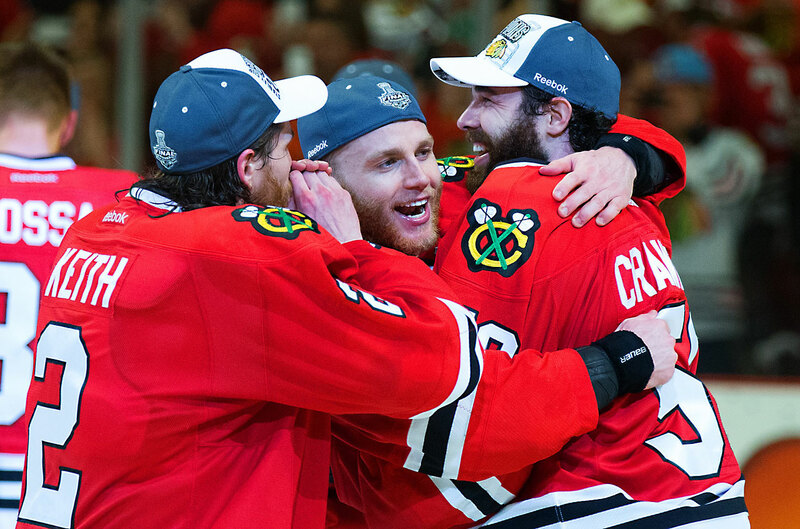 Duncan Keith (2), Patrick Kane and Corey Crawford enjoy an embrace during the postgame celebration. 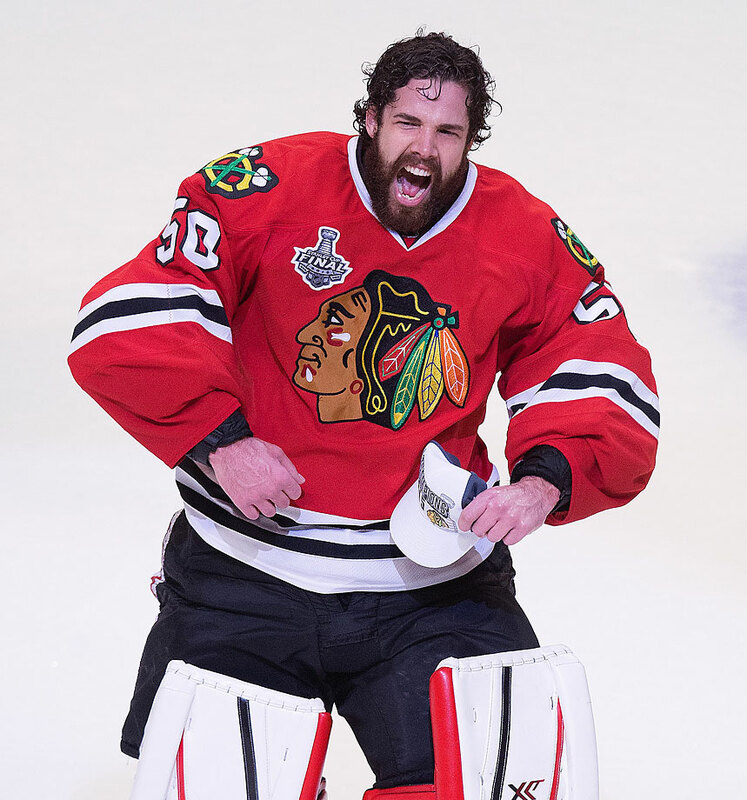 Corey Crawford had 25 saves in his fifth career playoff shutout. 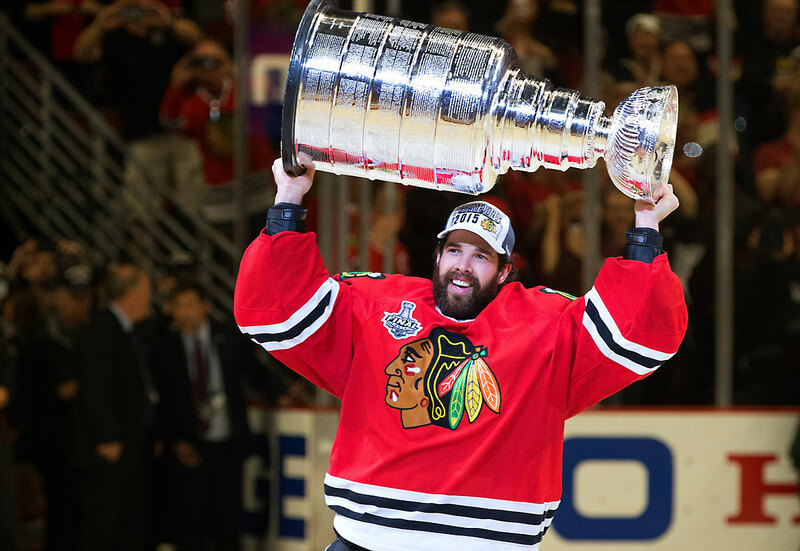 Corey Crawford and the Blackhawks held the NHL's highest-scoring team in the regular season to just 10 goals in the Stanley Cup final. Patrick Kane had a goal and an assist in Game 6. 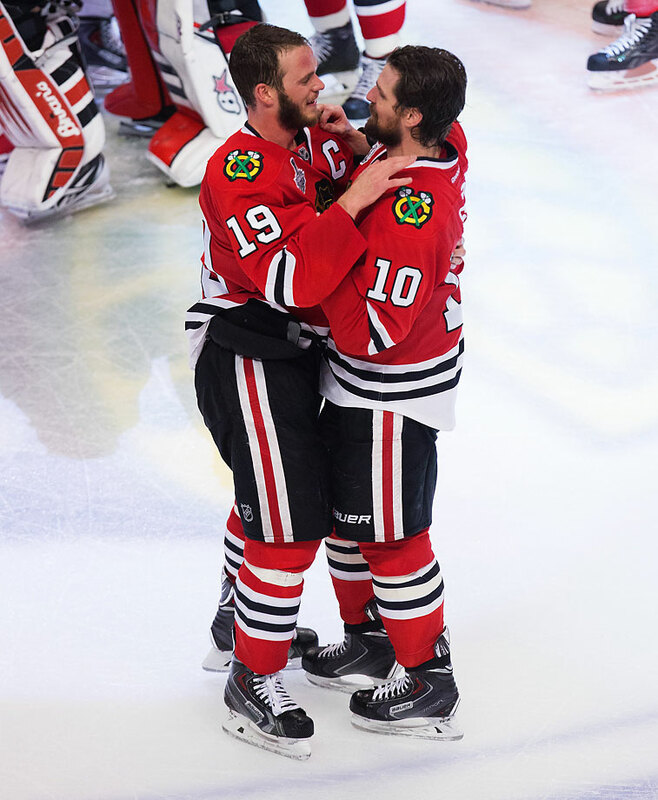 Jonathan Toews (19) and Patrick Sharp enjoy the moment after a grueling season. 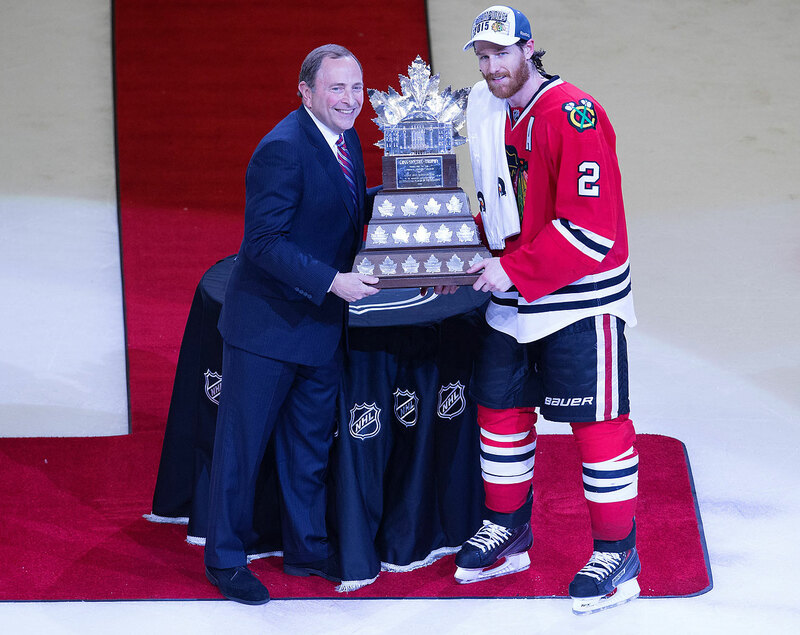 Commissioner Gary Bettman presents the Conn Smythe Trophy to Duncan Keith, who was a unanimous selection for playoff MVP after he finished with 21 points while playing over 700 minutes in the postseason. 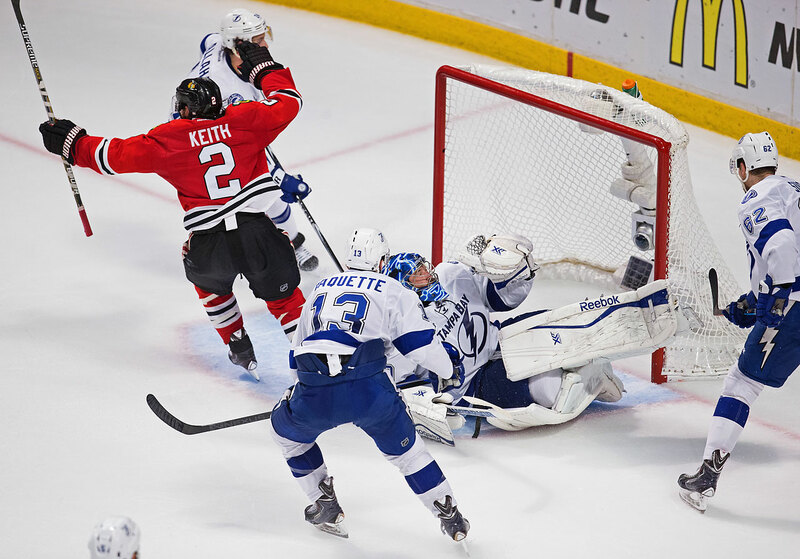 Duncan Keith made it a 1-0 game when he flipped in a rebounded shot in the second period against Ben Bishop. Duncan Keith celebrates his goal. 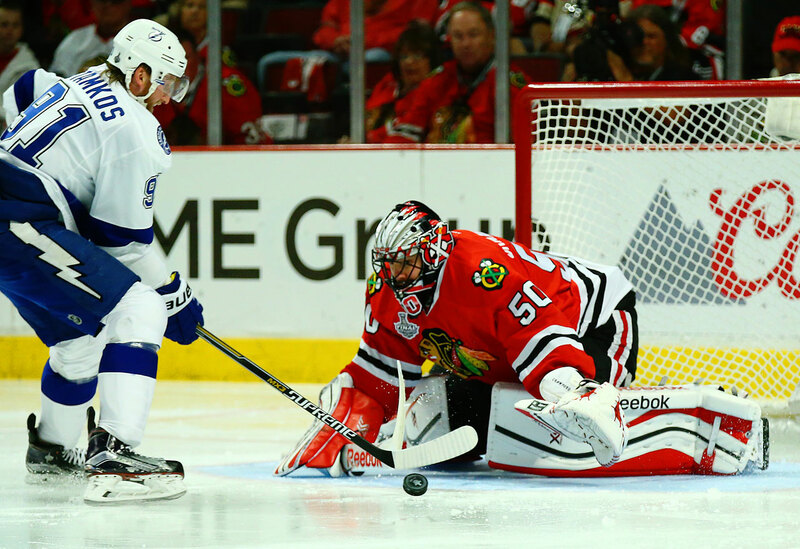 With the Game 6 victory, Corey Crawford and Chicago dealt Tampa Bay its first three-game losing streak of the season. No one deserved it more. And after less than three minutes of patter, Keith was back to his unremitting self, once again single-minded with a prize in mind. The Smythe trophy sat upon a swath of red carpet on the United Center ice. Keith shuffled over and gathered his family around, standing Colton front and center next to the bulky prize. The littlest Keith swigged some Gatorade from a squeeze bottle and mugged for the phalanx of cameras before him, before unhanding the drink and taking a picture, just he and his dad, the best player on the ice just about every night on this latest championship charge. With an unforgettable moment properly captured, Duncan Keith buried his nose into his son’s neck one more time before returning to the celebration at large. He could relax now. He had everything he’d come for.